A. Ask Foghorn: Is .22lr The Best for Self Defense? 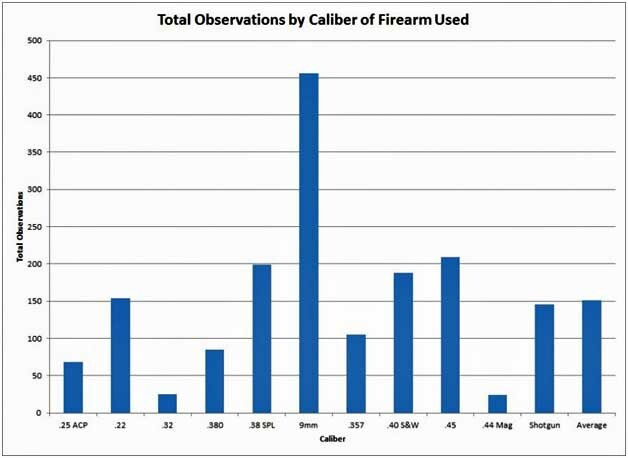 About a year ago Greg Ellifritz over at Buckeye Firearms concluded a pretty darn impressive analysis of gunfight data recorded over a 10 year period, the total count of incidents included in his analysis topping 1,800. It doesn’t give us a statistically significant look at murders in the United States, but the data is sufficiently large and normal to give us the ability to use his results to compare the effectiveness of different calibers. Admittedly 9mm does take up a disproportionate percentage of the observations and .32 data is a little skimpy, but its good enough for our purposes. So, using his data, let’s take a look at how well the lowly .22 round does compared to other handgun calibers (and shotguns, just for comparison sake). 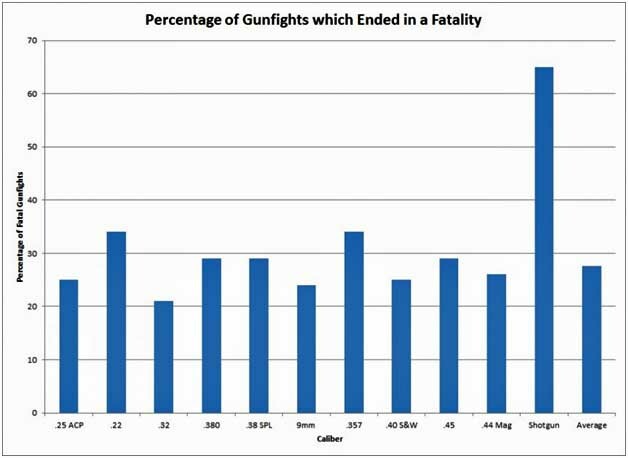 First things first, let’s see what percentage of observed gunfights ended in a fatality for the person on the receiving end. The graph is pretty clear on this: .22 caliber firearms are just as deadly in a gunfight as any other handgun caliber. In fact, it beat the average (far right). Surprisingly, every caliber that begins with a 4 (.40 S&W, .45, .44 Mag…) performed worse than the .22 caliber firearms in terms of putting the opponent in the dirt for good. The next thing I thought was interesting was the metric about how many rounds it took to incapacitate the opponent. In case you were wondering, the smaller the bar in this example the better the round performed. And, in terms of performance in putting the opponent down, only a shotgun beats the .22 round. I get the feeling that in reality you can chop a round off the 9mm’s numbers, as the double tap has been trained into almost every shooter these days and probably means the numbers are artificially high. Greg also includes something about a “one shot stop” percentage, but I don’t agree with his methodology on it and is not presented here. Go read up on it at the original site if you’re interested. There’s a small fly in the ointment: the percentage of incidents where the opponent was not incapacitated. Another chart where large bars are bad, and here the mouse guns aren’t doing so hot compared to the big boys. However, I get the feeling that this chart is somewhat deceptive with its results. 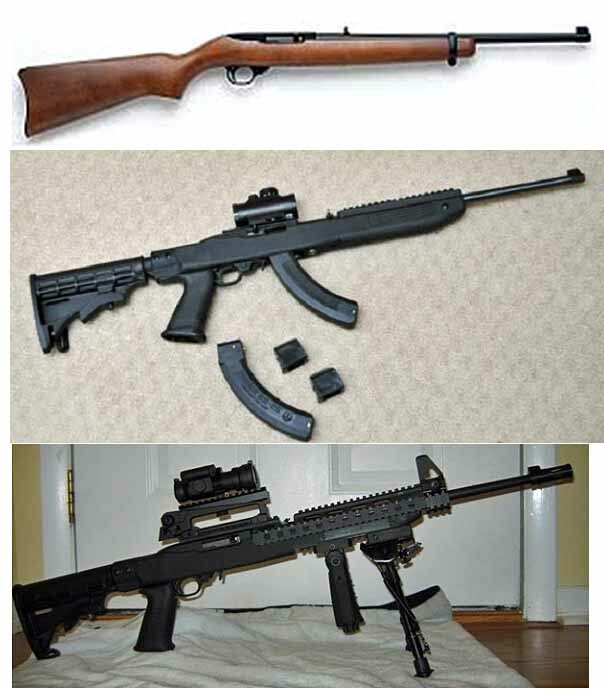 Newer shooters have a tendency to get the smaller guns with smaller calibers, and also have a tendency to not be as well trained as those carrying the larger rounds. 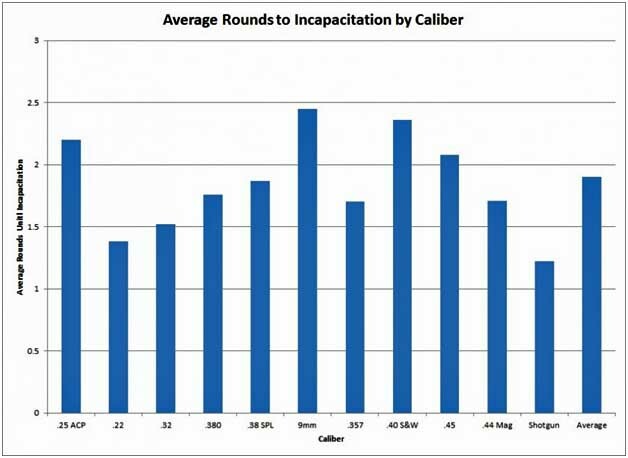 So, instead of this chart being an argument against the lowly .22 round I see it as an argument against poor training. As we saw with the last chart, IF you can hit the guy there’s a great chance he’s going down. But the issue is hitting him, and incorporating some of the accuracy results from the original study seems to back up my suspicions. So, in short, what’s the answer? Is a .22 a good self defense round? According to the numbers, it looks to be among the best in terms of stopping the threat. Add in the fact that it’s lightweight, low recoil and uses firearms that are ridiculously easy to conceal and you can see where a .22 caliber firearm for concealed carry might be a winner. > Take that pain, and quadruple it, at the minimum. In fact, most .22LR rounds generate 100+ foot-pounds of energy, so multiply the pain by somewhere around 20 times. Then couple that with the fact that it isn’t just a surface wound, so you’re going to have to deal with bleeding, which may cause lightheadedness at the least, and passing out or death at the worst. That’s only if you got shot somewhere that there are no vital organs. If you get shot in the chest, you could die within a few minutes. A nick to the aorta would cause you to bleed out fairly quickly. For that matter, being shot in the leg could kill you in a matter of seconds as well; a cut femoral artery would likewise empty your blood quickly. > You ever seen swamp wars? yeah, them gators died with one shot to the dome…an alligator! I’d imagine it would feel like being shot by a firearm. > Well it damn near killed President Reagan. > Robert F Kennedy was killed with a cheap .22LR revolver. > Look at one shooting – Hinckley shooting Reagan in 1981. Hink gets off 6 shots of 22lr. One hits Macarthy in the belly (Secret service guy, stepped in front of Reagan); another hits DC cop Delahanty in neck. One hits Brady in forehead; 2 miss; last one hits Reagan under arm, goes thru lung. Results: Macarthy drops to ground (probably can’t believe he just stepped in front of a bullet); Delahanty goes down; Brady goes down – central nervous system hit; Reagan thinks his SS guy broke his ribs pushing him into the car. > Well, FWIW in my 20+ year’s as a former LEO I’ve seen more people killed from a .22 LR Hollow Point; than I have any other caliber, bar none! One case that stands out in my mind is where my partner and I answered a “person down” call. When we arrived on the scene, one victim was laying in the drive-way shot in the stomach (belly button) with a .32 S&W Long; the other victim (and perp) was on the front porch shot under his right arm with a .22 LR Hollow Point. The victim shot with the .32 S&W Long survived the shooting to live another day; the victim and or perp shot with the .22 LR Hollow Point was declared D.O.S. by the county corner. 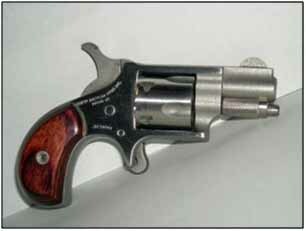 So to answer your question, YES the .22 LR Hollow Point can be very deadly; especially when a vital organ* is struck. > I’ve been shot with a .22 LR–trust me, it ain’t no picnic. You don’t want it. There’s no glory and no background music there when they’re messing around with your bones and that drain tube. > …As to how lethal the .22LR is–although illegal for whitetail deer hunting, it has killed as many deer as many centerfires. THEY ARE DEFINITELY NOT TOYS, AND SHOULD BE TREATED WITH GREAT RESPECT. > … have NO doubts about its lethality.. it lacks STOPPING power, but pure killing power, it’s actually very good at. > A .22lr round to the head is exceptionally lethal – the bullet typically has enough energy to penetrate one side of the skull but not the other, resulting in it ricocheting around inside the skull and shredding brain tissue almost as badly as a larger caliber hollow point would. > There are countless stories of people who get hit with a .22 bullet and never notice that they were hit until someone points out the blood. Of course, shot placement remedies many of those complaints, but in combat incapacitation is as good as a kill, and sometimes better because then his buddy has to drag him away. > I find it hard to believe that a person would be hit by a .22 hollow-point and not notice. The effects on animal flesh, from what I’ve seen, are startling (and horrific). The hole going in is tiny, but the hole coming out is – gross. If it did that to a porcupine, would it not do the same to a person? > …a .22 (especially a hollow point) won’t have any useful penetration. It’ll be stopped by the lightest body armor, or a thin wall, or the multiple layers of sheet metal in a car door. > .22 is one of the most feared rounds to get shot with according to policemen. The explanation given to me was that a .22 has the velocity to enter the body but slow quickly and if it meets with resistance, like a bone, it will ricochet around inside of you making it difficult for a surgeon to repair the damage. 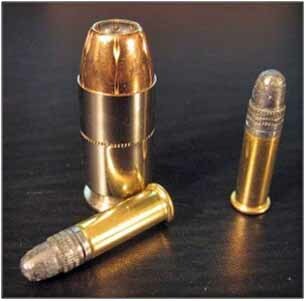 A 9mm on the other hand will often travel right through you in a straight line and be far less dangerous than a .22. 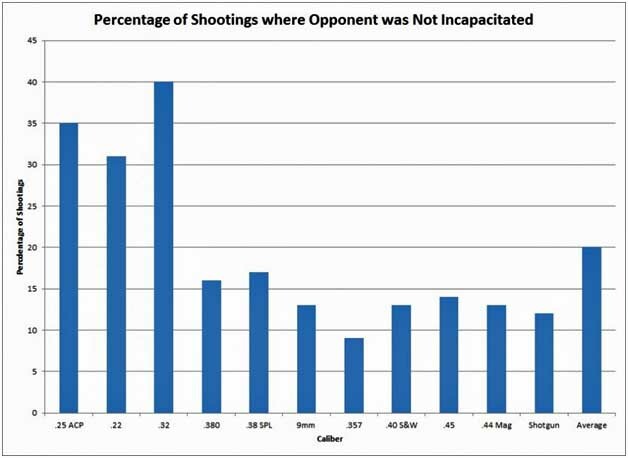 Pasted from: http://www.activeresponsetraining.net/using-the-22-for-self-defense Since my handgun stopping power study was published last month in American Handgunner Magazine, I’ve received several questions from readers about my data. I expected to be castigated by all the big bullet aficionados for reporting honest data about the “mouse gun” calibers. That wasn’t what I received. The reader asked me to explain why I considered the .22 stops to be more likely “psychological stops” as opposed to physical incapacitations. That’s easy to explain…and it doesn’t have anything to do with the size of the muzzle. How quickly could you shoot this tiny single action revolver? Data that you assume means a superior cartridge could be attributed to a slower rate of fire. Yes, the criminals fled, but they were not incapacitated. They could continue to fight back if they choose to. If you were to face the rare motivated criminal who presses the fight, would you want a .22 or something else? Encountering the motivated criminal who presses the fight against an armed citizen is exceedingly rare, but it is a possibility. Should you prepare for the statistical norm or the statistical anomaly? In my view, I think it’s best to prepare for the worst possible outcome, rather than the most likely. Statistically, you are unlikely to ever need a gun at all, yet most of my readers want to prepare for the worst, so they carry a gun. Why wouldn’t you use the same logic when choosing an appropriate defensive sidearm? Unless you’re fighting zombies, skip the crossbow.